Netflix and Apple are the stocks you want to watch today. Those and more are what's in the news Tuesday on Wall Street. The Dow industrials (^DJI) edged just slightly higher Monday, the S&P 500 (^GPSC) added 3 points -- to mark its 23rd record high of the year -- and the Nasdaq (^IXIC) rose 12. Melinda Sue Gordon, Netflix/APActor Kevin Spacey in a scene from the Netflix series "House of Cards." Netflix says its quarterly profit soared nearly fivefold from a year ago, even better than Wall Street had expected. But subscriber growth to the movie streaming service was a bit off target. 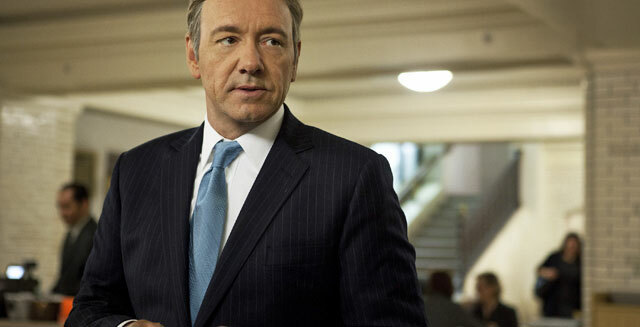 Last week Netflix received 14 Emmy nominations for its original series, including best drama for "House of Cards." Now investors want to see if it can turn those nominations into new subscribers. Netflix (NFLX) shares have more than tripled in price during the past year, but they're set to slide Tuesday morning. Dow components DuPont (DD), United Technologies (UTX) and Travelers Cos. (TRV) are also out with quarterly numbers this morning. In addition to its earnings, DuPont says it may sell its performance chemicals business, which is the company's second largest revenue producer. After the closing bell, we'll hear from Apple (AAPL) and AT&T (T). Apple's net is likely to drop from a year ago as it's been quite a while since the company has introduced an important new product. On the merger front, CapitalSource (CSE) has agreed to be acquired by Pacwest Bancorp (PACW) in a deal valued at $2.3 billion dollars. Taco Bell is taking the toy out of the taco. The Yum Brands (YUM) unit says its will stop selling kids meals and toys, probably early next year. It wants to focus on attracting young adults. The company says kids meals account for less than 1 percent of its overall sales. Finally, how much money do you need to have to be rich? A survey by UBS (UBS) found $5 million is the magic number for most people, with $1 million of that in cash. Half of the respondents also said being rich means having "no financial constraints."